Every industry has its shady characters. Luckily, they can usually be avoided because we know what to look for. We stay away from car salesmen with too much pomade, teachers with criminal records and anyone who leaves a bluetooth headset in their ear all the time. But what about new professions without clear warning signs? This article examines how to compare SEO companies by examining their rhetoric, industry practices and ethics. To prepare for the agency interview process, I have armed you with a comparison cheat sheet. Bust it out for the question session after their pitch and the bad guys will never know what hit ‘em. Shady SEOs love to make big promises. “We guarantee a 5x increase in organic traffic” or “a #1 ranking on Google.” That last one’s always my favorite. Unless they have a godfather in Google’s C-suite who owes a favor, no one can promise anything from search engines. The best an agency can do is outline their goals and how they plan to reach them. To compare agencies, ask, “What guarantees can you make about returns on my investment?” Listen for the agency that only promises to work their asses off to achieve sustainable month-after-month growth in organic search traffic. Quick fixes and shortcuts are simply not worth the gamble because it is just a matter of time until search engines get wise and seek vengeance like a scene from Casino. You are looking for a slow, steady climb with no chance of bust. This is your online reputation, after all, so don’t try your luck with a gambler. The House always wins. A SEO company’s portfolio says a lot about their experience and level of service. Would you prefer an agency that worked with Harvard University or Downtown Upstairs Technical Institute? The answer is obvious. If they were good enough for the best in another industry, they are more likely to be the best for you, too. To compare: “Have you worked with anyone that I’ve heard of?” Count the seconds of delay or stuttering. If they can’t offer any strong, sustainable organizations, then you probably don’t want your logo on their customer list, anyway. Many SEOs hate to talk about the influence of social media on search because it is threatening. Whether they like it or not, social and SEO are becoming codependent, and that bond will continue to grow as search engines add weight to social signals. Duane Forrester, from Bing, has preached the value of social media all year on the Webmaster Center blog. Some really smart guy named Andrew Garberson has been talking a lot about search + social too. To compare: “Do you incorporate social media with your SEO?” A good SEO’s eyes should light up at the mention of social because retweets, shares and +1s are exciting tools to improve link building and increase traffic. A positive reaction also shows that the agency is forward thinking, which translates to longevity and sustainability for you and your organization. Google’s Panda and Penguin algorithm updates (continue to) hurt websites of every size. For some perspective, about ⅓ of the SEO calls that we receive at Bounteous are from business owners or webmasters who witness a mysterious drop in online traffic. It doesn’t take long to learn that they, or more likely one of their hired consultants, participated in risky tactics called black hat SEO. The search engines figured out their game and penalized them accordingly. 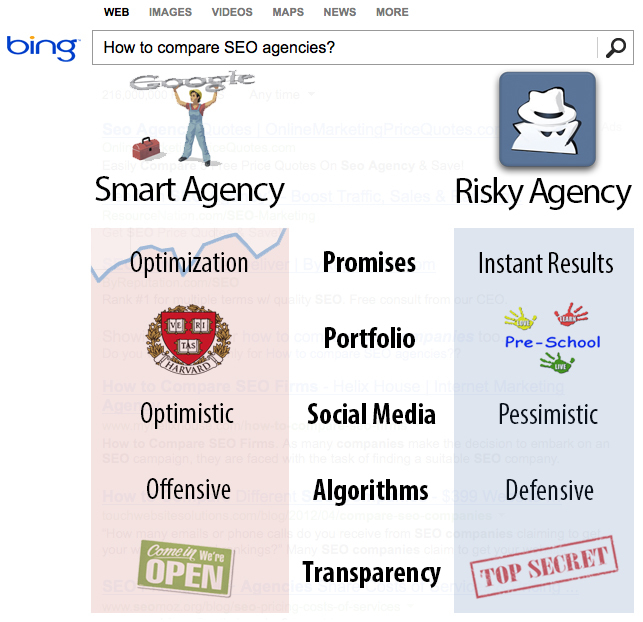 Lots of SEOs act like their strategy is the agency’s secret sauce. Good SEO is 70 percent science and 30 percent art. That means they should provide detailed reports on the majority of their labors. I mean, I would invite clients to pull up a chair at my desk if I wasn’t afraid of boring them with source code or suffocating them with coffee breath. There should really be nothing to hide. To compare: “How often do you report on progress?” Once at the end of the contract? Not good enough. Find an agency that issues updates once per week. If they can’t provide that frequency, there is a good chance that they have nothing to report or worse nothing within the boundaries of Google’s best practices. Don’t be intimidated by SEO agencies or their processes. They are working for you, aren’t they? If you have trouble during the interviews, just consult the SEO comparison cheat sheet. And always avoid people with bluetooths!